Cyclists in the City: Southwark Council hints it will review Upper Ground closure but Richmond Council completely fails to deliver road safety for cycling. Time for Richmond council to engage meaningfully with its cycling residents. Southwark Council hints it will review Upper Ground closure but Richmond Council completely fails to deliver road safety for cycling. Time for Richmond council to engage meaningfully with its cycling residents. I wrote last week about Southwark Council's decision to close - for a whole year - the main cycle thoroughfare between Waterloo and the City of London. Some good news for a change: Southwark has agreed to convene a meeting onsite with advisors from Transport for London, from Southwark Cyclists and I'll also be there. This is a positive step. Southwark Council has been trying to get cycling right over the last few months. But it clearly has not yet reached a stage where cycling is part of the planning ecosystem within the council. This meeting will look at options for a safe route to cycle along this route around the building works. But it will take place only one week before the barriers go up, blocking the route. The fact is, cycling simply hasn't been considered at all in the planning mix, despite the fact that this is a) a National Cycle Network route and b) is one of the busiest commuter routes in London. It's a case of better late than never. But it highlights a dangerous lack of consistency in Southwark council's approach to cycling that needs addressing. The issue of consistency is a real barrier to cycling in London. For all the faults of the Cycle Super Highways, they do at least make an attempt to create a consistent experience for people along the length of the route. It's not a great experience but it at least makes a start. Compare that with the protected bike track through Bloomsbury and Fitzrovia. As soon as the track leaves roads that are controlled by Camden and enters roads that are controlled by Westminster, the cycle track disappears and turns into car parking spaces. The government is pushing more and more responsibility for transport on to local government. All of which means that decisions taken at borough council level are incredibly important. If the borough council doesn't have its house in order (as it doesn't in the case of Southwark at Upper Ground), then nothing is going to get better for cycling. To give Southwark credit where it's due, however, the council very actively fought to make sure that another one of its roads remains safe for cycling. This is Churchyard Row, part of the Elephant & Castle cycle bypass, and part of the Cycle Super Highway from Tooting. The council has ensured that lorries being used to transport material to and from building sites around this location will be diverted well away from the Cycle Super Highway. Ten points to Southwark for doing this at Elephant & Castle, zero points for failing to think the same way at Upper Ground. At least Southwark is thinking about cycling at all. This is in sharp contrast to Richmond Council, where the borough spokesman for cycling seems to believe that to make cycling safer on borough streets you just need to make cycling sound like it's safer. In a recent statement, Richmond council's cycling representative states: "If we want to encourage more people to cycle let’s stop saying it isn’t safe". That seems to be the start and the finish of the strategy - don't make the roads safer, just make people think and feel happy thoughts about cycling and all will be well. The fact is a) her strategy is deluded and b) it's not even true. As The Times wrote in a hard-hitting article today, the rate at which cyclists were killed or seriously injured rose sharply last year. "Measured as a proportion of distance pedalled the rate rose by 9 per cent in 2011 compared with 2010 and was the third consecutive year in which it increased. The data undermines government claims that it is becoming safer to cycle as increased numbers of cyclists take to the roads." In that context, it seems all the more astonishing that Richmond Council has recently indicated that it intends to remove one of the few stretches of protected cycle path in Twickenham town centre. During the consultation phase, 67% of people who took part said they were not in favour of the cycle lanes being removed from London Road. The council rightly points out that the cycle lanes in the town are 'currently disjointed and only cover part of London Road." So what does Richmond borough council propose? Does it propose making high quality, safe, usable cycle facilities through Twickenham town centre? "The Council are now considering installing advisory cycle lanes throughout the town centre in King St and London Road in both directions. In peak periods vehicular traffic would use these lanes but for the greater part of the day they would be used by cyclists. These cycle lanes would increase cycle safety throughout the town centre and would also help to encourage cars and other vehicles to stay in the central lanes in off peak periods, therefore keeping their distance from pedestrians." The local cycling campaign group is made of reasonable, intelligent, professional people. 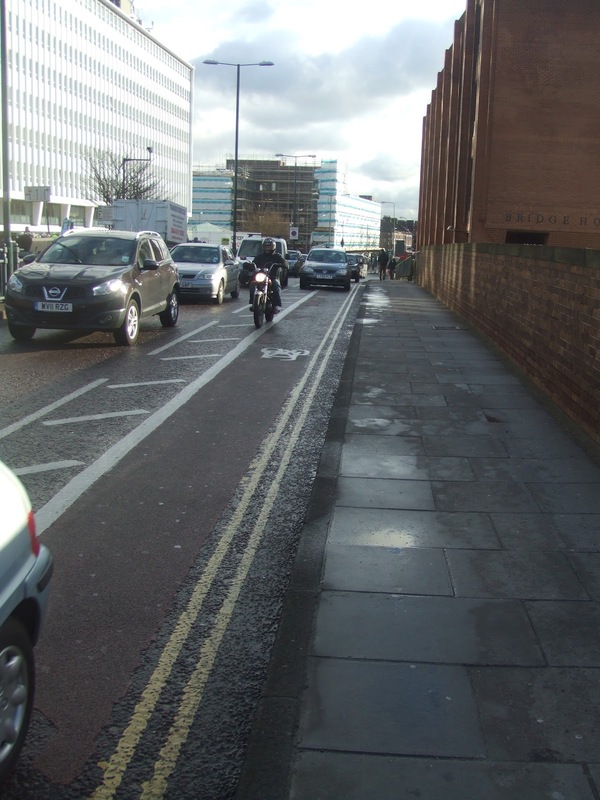 The Richmond Cycling Campaign has suggested that "rather than removing the cycle lane, [the council] should have improved it, putting in a proper physical division to stop encroachment ...[and] improved the connection to the railway station." "The council is convinced this is an improvement, completely misunderstanding why people do not choose to cycle in the borough. The reason why the share of cycling as a mode of transport is relatively high in the Borough is because of the large number of off road cycle routes – along the Thames, through the parks. This demonstrates the need to have safe cycle infrastructure." It strikes me that Richmond Council is in an awful muddle about cycling. Rather than try to encourage cycling and do something to combat motor traffic congestion, it's proposing a cycle lane solution that will be filled with cars during rush-hour, rendering it unusable for everyday cycling from A to B. The tragedy is that the council knows what the problem is. It's right there in the statement: "the cycle lanes are currently disjointed and only cover part of London Road." Absolutely correct. But a solution that paints a few lines across a narrowed street and is only usable outside rush-hour, is as good as useless. Richmond needs to find people it can work with and start treating cycling as a serious part of its transport mix. If it doesn't, it will simply mean more congestion, more pollution, more of all the things the council says it's opposed to. Perhaps it could start by engaging with its existing cyclists rather than trying to deliberately alienate them. It is really unsatisfactory that cycle provision is left to the device of local politicians. While some, mainly Libdem councils as far as I can see, do quite well, most are pretty useless – councillors do not appear to me to be of very high calibre and they are more easily swayed than ambitious national politicians by their own prejudices, noisy and strident minority pressure groups especially over car parking issues, and golf club chit-chat. Perhaps what we need is to follow the pattern of education and highways, where local authorities manage their own services but are bound by strict national standards eg the National Curriculum for schools. Then perhaps we will have enforceable standards for cycle infrastructure. Even quite enlightened local authorities can come under pressure though. Gosport is a little town in Hampshire (and my home town), facing Portsmouth across the harbour and tucked into the nose of a peninsula. Since the decline of the Navy it has lost a lot of jobs so that it now has only 0.4 jobs per working-age adult. It doesn’t have much unemployment though, because residents commute out of area to work. Gosport is also a well-hidden “hero” of cycling, with more regular cycling going on than Bristol or Hackney, at around 11.5% cycling more than 3 times a week, placing it in the top 7 or 8 areas in the country. High cycling rates are no doubt brought about by a combination of “push” factors and “pull” factors. Gosport has obvious push factors such as: to commute to Portsmouth you can either walk/cycle to the harbour ferry, cross the harbour and walk/cycle the other side, or you can drive 16-8 miles all the way round, and; all those people commuting out to work along the only road off the peninsula create atrocious road congestion, not just in rush-hour. It does also have pull factors in the form of some quite respectable cycle paths. There is one, which I have been dismissive of before because it appears to end in the middle of nowhere, which I now see in a different light, having seen that it actually forms an almost continuous, if slightly roundabout, safe route between a suburb and one of the principal senior schools, and at 3:30pm was busy with kids going home. So, it is all the more disappointing that when the government decides to spend £25m on an enterprise zone on the redundant naval airfield at Lee on Solent, potentially creating 4,000 jobs which would reduce the daily outflow, all the council and the local MP can do is whine about how are the going to manage the extra traffic. For God’s sake get a grip – it’s as flat as aboard and the whole area is barely 4 miles across! Sometimes I wonder at the mental capacity of local councillors, and Richmond seems a case in point. "In peak periods vehicular traffic would use these lanes but for the greater part of the day they would be used by cyclists," they say, but have they actually gone out and looked at the traffic on the streets? Haven't they noticed that the number of people cycling is at a peak in, er, the peak periods? That's when people cycle to work, you muppets! Great post. Think the lesson is that we need a London-wide cycle strategy which both Mayor and borough sign up to and which covers both 'big' and 'small' infrastructure, as Londonneur says here http://londonneur.files.wordpress.com/2012/09/cycle-plan-20121.pdf . The Superhighways are crap but even if they were brilliant they still only cover a tiny proportion of the network.